Sankara was born in a very poor family in the year 788 A.D. in a village named Kaladi, six miles to the east of Alwaye, Kerala. 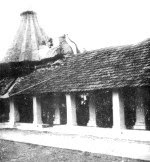 Kaladi is a railway station, on the Kochi-Shoranur rail link. Sankara was a Nambudiri Brahmin. 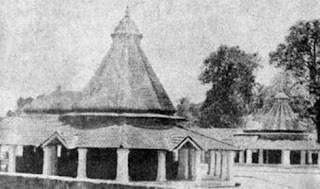 Rajasekhara, a Zamindar (a rich landlord), built a Siva temple in Kaladi and formed an Agrahara for Brahmins who were in the service of the temple.Vidyadhiraja was doing Puja (worship) in the temple. He had only a son named Sivaguru. Sivaguru studied the Shastras and married at the proper age. He had no child. 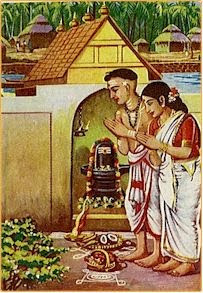 He and his wife Aryamba prayed to Lord Siva to bless them with a son. A son was born to them in the Vasanta Ritu or the spring season at noon, in the auspicious Abhijit Muhurta and under the constellation Ardhra. Sankara lost his father when quite young, and his mother performed his upanayana ceremonies with the help of her relatives. Sankara excelled in all branches of traditional vaidIka learning. A few miracles are reported about the young Sankara. As a brahmacArin, he went about collecting alms from families in the village. A lady who was herself extremely poor, but did not want to send away the boy empty-handed, gave him the last piece of Amla fruit she had at home. Sankara, sensing the abject poverty of the lady, composed a hymn (kanakadhArA stavam) to SrI, the goddess of wealth, right at her doorstep. As a result, a shower of golden Amlas rewarded the lady for her piety. On another occasion, Sankara is said to have re-routed the course of the pUrNA river, so that his old mother would not have to walk a long distance to the river for her daily ablutions. Sankara had none to look after his education. His mother was an extraordinary woman. She took special care to educate her son in all the Shastras. Sankara exhibited extraordinary intelligence in his boyhood. When he was only sixteen, he became a master of all the philosophies and theologies. He began to write commentaries on the Gita, the Upanishads and the Brahma Sutras when he was only sixteen years old. What a great marvel! 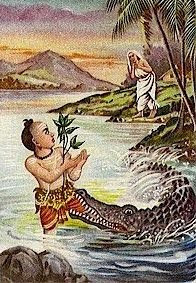 However, once when Shankara was bathing in the purna River near his house, a crocodile gripped his leg and began to drag him into the water. Only his mother was nearby, and it proved impossible for her to rescue him. Shankara asked his mother to give him permission to renounce the world then and there and so die a monk. At the end of her wits, his mother agreed. Shankara immediately recited the mantras that made a renunciate of him. The crocodile released him and swam away. Shankara emerged unscathed from the water.Shankara then left Kerala and travelled towards North India in search of a guru.